The Open in Emergency REPRINT is coming! August 2019. Stay tuned for contests and a Kickstarter campaign in spring and summer 2019. Please direct any inquiries to editors@aalrmag.org. 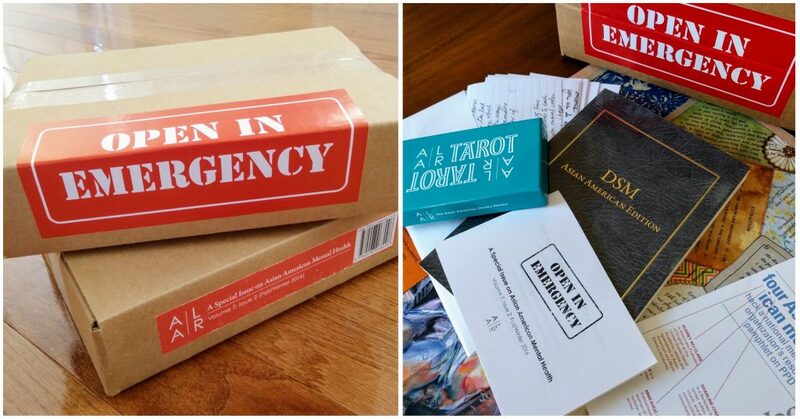 Open in Emergency: A Special Issue on Asian American Mental Health is AALR’s most ambitious project yet, and we’re so grateful for the support from the community: so many supported our Kickstarter campaign last summer to raise funds for the issue. This project wouldn’t be possible without their generosity and investment in our collective wellness. Rather than trying to recalibrate our existing mental health resources to better engage race and Asian American experience, we decided to start on the opposite end, with what wellness, unwellness, and care actually look like in Asian American life. With the help of an amazing group of writers and artists, scholars and teachers, practitioners and survivors (see below for a full listing of contributors), we’ve created a work of book art that decolonizes mental health and opens up a wealth of new approaches. Our existing approaches not only aren’t enough–they’re part of the problem, sometimes unwittingly, sometimes openly conducting white supremicist, heteronormative, misogynist, and ableist violence against the very people for whom they claim to provide care. a foldout testimonial tapestry— a collectively woven tapestry of written and visual testimonials, a process-oriented art piece that reimagines community care & healing. featuring fiction and essays on neuro-diversity and race; a queer mixed race WOC self-care package; a play excerpt examining conceptions of mental illness as demonic possession in Lao communities; and poetry on the lasting psychic rupture of Partition, among many other pieces. and violences, Asian American daughterhood and motherhood. For press coverage and interviews with the editors and contributors, go here. 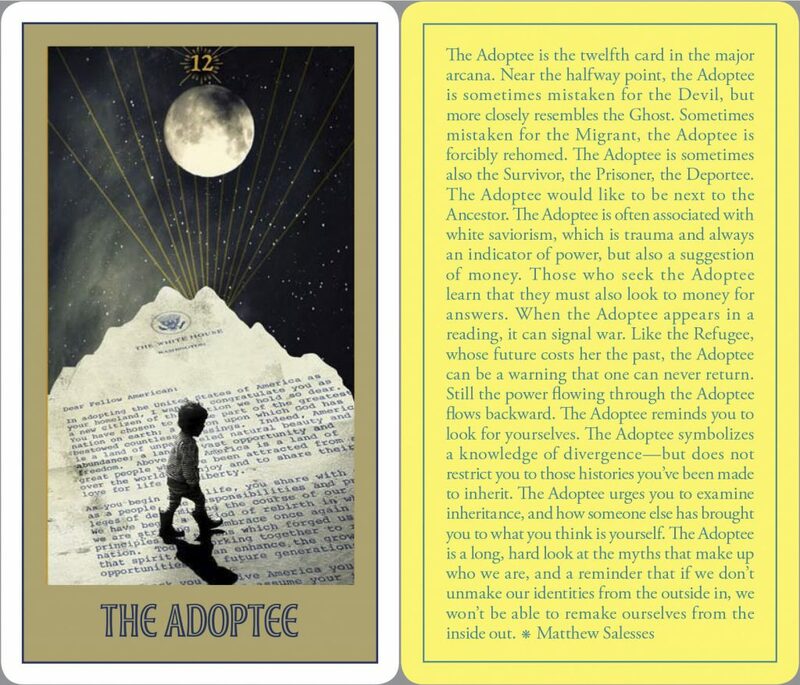 Buy the full issue or just the deck of tarot cards (the issue includes a deck) above. For bulk orders and course adoption, please email us at editors@aalrmag.org. We are very happy to be able to donate a limited number of copies of the issue to places of need. If your organization would like to request copies, please fill out this form. interactive virtual spaces designed to put students in conversation with one another. We’ll also help seed one-on-one video conferencing between classes for those interested. The goal is a national conversation that builds academic community, a dialogue among students and teachers across the country that challenges and grows our understandings of mental health. 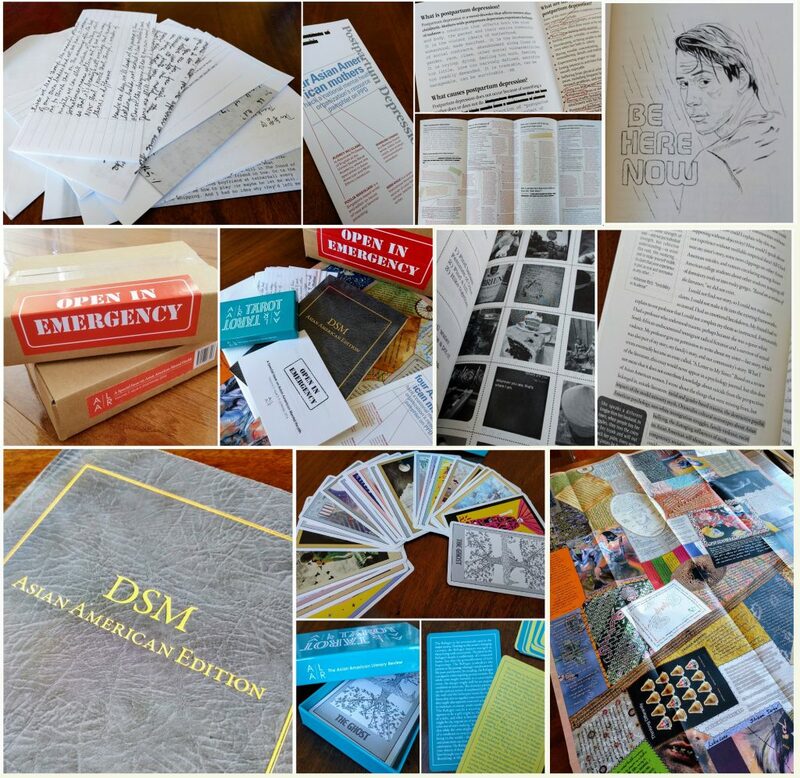 Because of its cross-disciplinary approaches, the issue is a fit for a range of courses: Intro to Asian American studies, Asian American literature, Asian American psychology, Asian American art and visual cultures, Asian American sexualities, Women and Gender studies, Queer studies, disabilities studies, race and health. To accommodate a wide variety of schedules and class needs, we’re making the commitment open-ended: we’ll have the program live throughout the spring of 2017, from January through May, with curricular materials and exchange possibilities available throughout—but your class can participate for anywhere from a week to the entire academic term. If you believe as we do in the importance of reimagining Asian American mental health, please consider supporting this project’s development by serving as an official sponsor. Your contribution can fund general issue production, featured work by particular artists and writers, or distribution of copies to underresourced spaces of need—libraries, community centers, counseling centers. All sponsors will be prominently recognized in the issue and on the teaching program website. Please inquire at editors@aalrmag.org for more details about sponsor recognition, advertising opportunities, the teaching program, or other possible avenues of support. This entry was posted in AALR Mental Health Special Issue, Issues: Table of Contents and tagged mental health, special issue. Bookmark the permalink. When will I receive my Open in Emergency Package and Tarot deck? Please email us at editors@aalrmag.org with your inquiry and we will respond as soon as we can. Thank you!